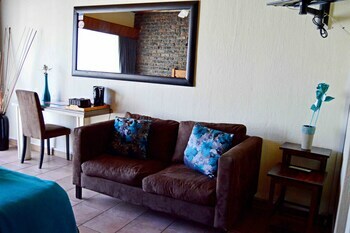 Located in Ermelo, West Street Inn - Ermelo is within a 5-minute drive of Ermelo Town Park and Ermelo Mall. Featured amenities include a 24-hour front desk and laundry facilities. Free self parking is available onsite. Located in Margate, Swallows Nest is a 4-minute drive from Margate Beach and 6 minutes from Ramsgate Beach. Free self parking is available onsite. With a stay at Waterhouse Guest Lodges 236/230 Bourke Street in Pretoria (Muckleneuk), you'll be within a 15-minute drive of UNISA and Kruger Museum. Free self parking is available onsite. With a stay at Oyster View in Umhlanga, you'll be a 1-minute walk from Umhlanga Lighthouse and 13 minutes by foot from Umhlanga Rocks Beach. Free self parking is available onsite. With a stay at Simonsview in Cape Town, you'll be by the ocean, within a 15-minute drive of Boulders Beach and Simon's Town Museum. Free self parking is available onsite. With a stay at Lizvilla in Akasia, you'll be 15.1 mi (24.4 km) from UNISA and 12.7 mi (20.4 km) from Kruger Museum. Free self parking is available onsite.